Wood handrail for interior stairs, offered in many wood species. 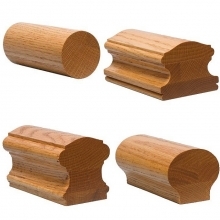 Please note: while our wood stair railing profiles are only offered in the most popular wood species online, which are: red oak, poplar hard maple, and cherry, our stair handrails are available in almost a wood species you can imagine. If you don't see the wood type you would like, please contact us for a quick quote. 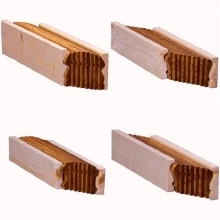 Please contact us for pricing on interior wood handrail wood species you are unable to find on this site. We will provide you with a formal quote ASAP. We also can quote custom handrails and custom bending handrails for curved stairs within 2 business days. 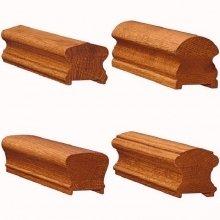 Red oak, poplar, and hard maple wood handrails are in stock for quick ship. Some wood handrails are in stock in american cherry. White oak, brazilian cherry (jatoba), soft maple, african mahogany, santos mahogany, lyptus, walnut, hickory, ash, birch, white pine, yellow pine, alder and antique heart pine, have a 2 week lead time to manufacture. The visual statement of a fine hardwood handrail system in any wood species, provides grand elegance to any luxury home or commercial property. Wood and iron stair railing installation is available in the metro Chicago area. Prefab custom wood staircases manufactured to your specifications are available and shipped internationally. We have shipped our stair railings to all 50 states, Canada, Japan, and many Caribbean Islands.